Skylanders Ring of Heroes invites every gamer for a long journey. 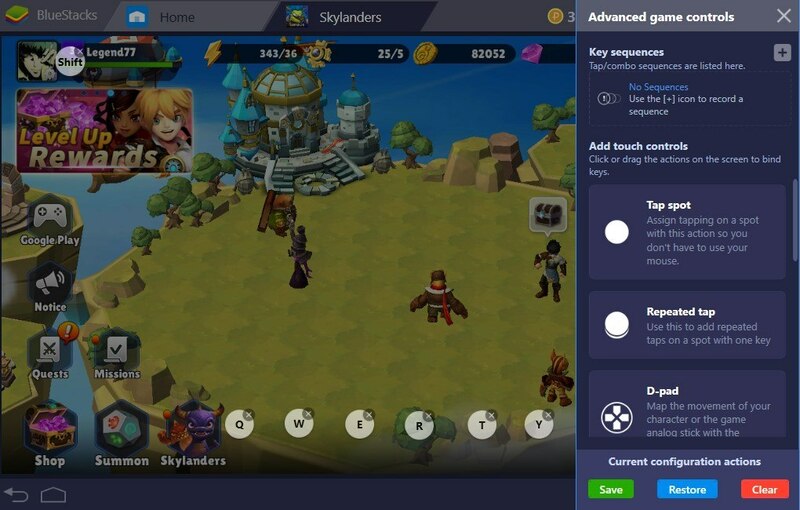 When we talk about a turn-based RPG game like Skylanders Ring of Heroes, we all know there must be some sort of grinding factor to it. That’s true; You will have to come over countless battles to acquire the best Skylanders and make them reach their utmost potential during your long journey. This journey takes place in a colorful and immersive world. But even though the game world is aesthetically immersive and beautiful, when it comes to combat, especially after some amount of grinding, it might start to feel mundane. However, thanks to the well-designed PvP mode, the game starts to feel fresh again. 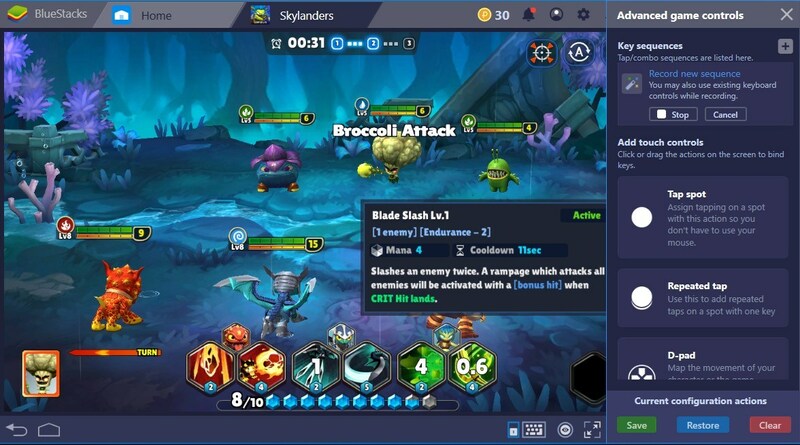 With the help of BlueStacks, you can get through these many lackluster PvE battles a lot quicker and make your way to the PvP mode. How do you ask? Using the “Combo Key ” feature of course. At the end of the article, we will provide you with more details regarding the combo key feature. But first, let’s show you how you can install Skylanders Ring of Heroes, shall we? 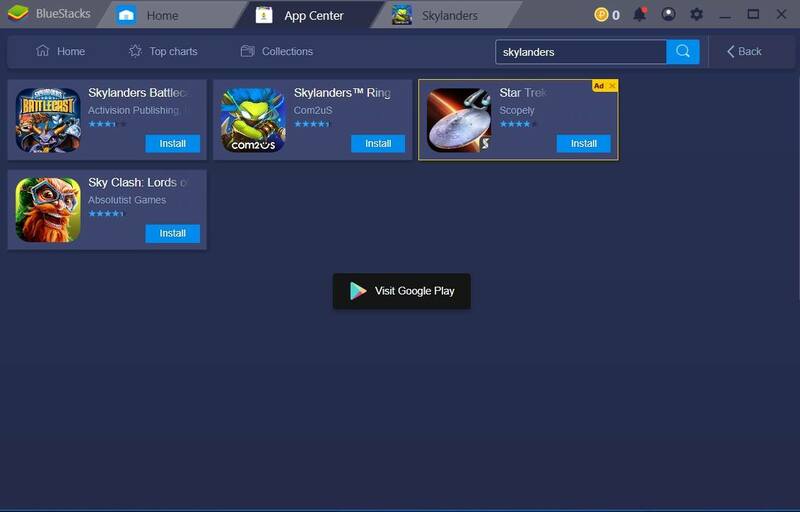 Installing an app on BlueStacks is very easy. You can install anything with ease by just typing the name of the app in the search bar. 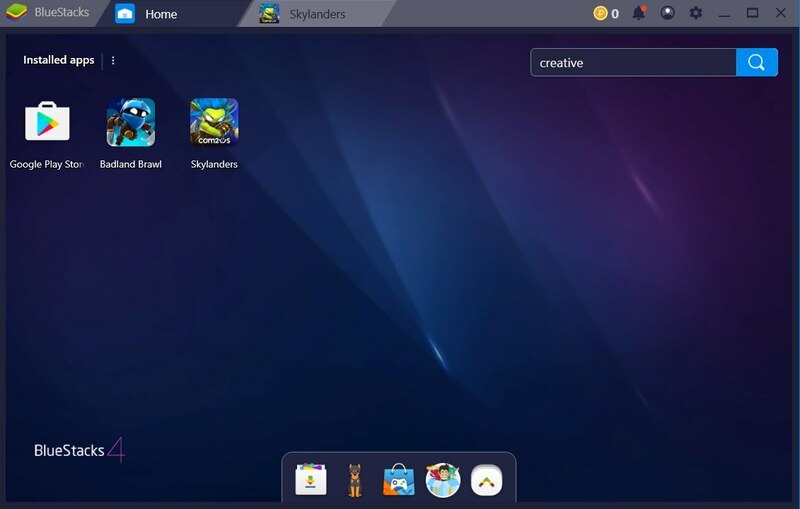 Just type “Skylanders” in the BlueStacks search bar and hit ‘Enter’. Skylanders Ring of Heroes will be displayed on the App Center. All you have to do is click on ‘Install’. BlueStacks will take care of the rest. After clicking install, the game will begin to download; after the download finishes, the game should appear on your home screen. Everything is ready to go! Just click on the Skylanders Ring of Heroes icon and launch the game. We all know how easy it is to play almost every single mobile game on BlueStacks. Skylanders Ring of Heroes isn’t an exception. When the game launches, the default BlueStacks configuration scheme will pop up on your screen. 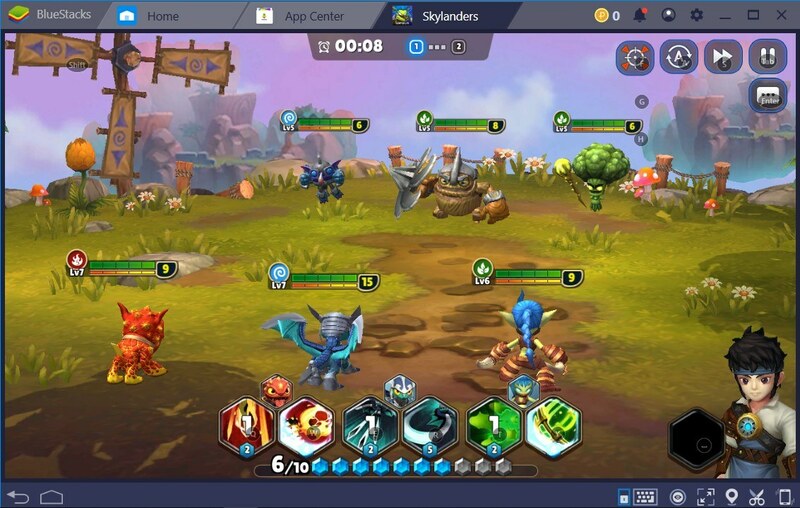 Being a turn-based RPG mobile game; Skylanders Ring of Heroes doesn’t require players to use a lot of different controls. The button layout is simple. The most important controls are the skills that every Skylander uses. Each Skylander has two unique abilities. Having a total of three Skylanders per battle means you have a total of six different abilities in your hands to battle with. 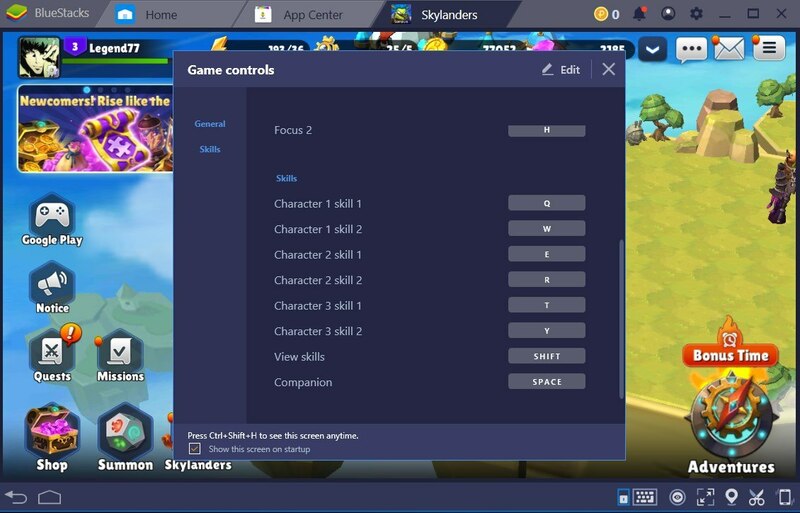 The default BlueStacks control scheme for your Skylander abilities is Q, W, E, R, T, and Y respectively. If this control scheme isn’t to your liking, you can always change it and make it more comfortable for you. To change the controls on BlueStacks, on the ‘Keyboard Controls’ screen, click on ‘Edit’ and change the keyboard mapping to your liking. You can choose any keyboard button to use, just pick what you like. Combo Key Feature is one of the many amazing features that BlueStacks provides. Skylanders Ring of Heroes is a fitting game to use this great feature. 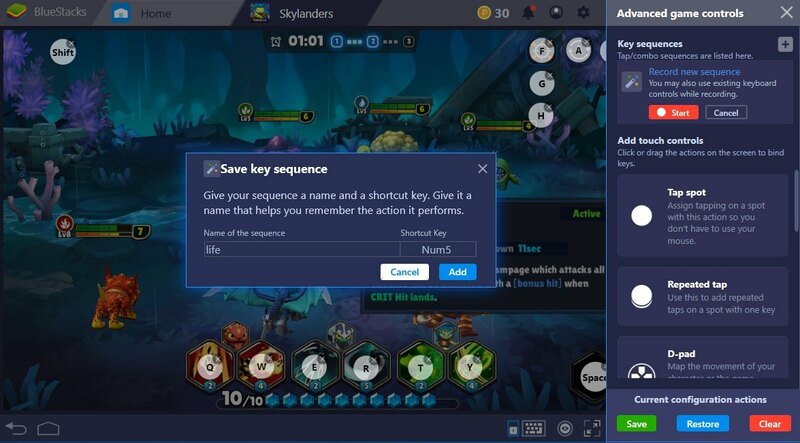 First, let’s learn how to add a sequence for the combo key feature and then tell you why it can be very useful while playing Skylanders Ring of Heroes on BlueStacks. To access the ‘Combo Key’ feature on BlueStacks, open keyboard controls and then click on ‘Advanced Controls’. Now all you have to do is click on ‘+’ to start recording a sequence. While recording a sequence, BlueStacks will memorize every button you used until the recording stops. After you have pressed on the necessary keys, just click on ‘Stop’ to end the recording. The final step is to assign a shortcut for the recorded sequence. Just type in the key you want to use for the whole sequence. Congratulations, you just created a combo key! Just by pressing your combo key, your button click sequence will commence. Instead of numerous cumbersome clicks, all of the attack you would have needed to do will be done with a single button. Sounds amazing, right? We talked about the grinding factor in Skylanders Ring of Heroes. Battling again and again for more resources might bore some players. So using this feature is going to mitigate the effect of joyless grinding. This reason is enough to use the ‘combo key’ feature when playing Skylanders Ring of Heroes on BlueStacks. However, there is also the elements factor to take into consideration. The elements are the pith of Skylanders gameplay. There are a total of ten elements. Each Skylander belongs to a certain one. Every single element is weak or strong against another one. Before fighting a certain Skylander, knowing their associated element is important. This way, you can prepare your Skylanders beforehand accordingly and make your battles a lot easier. Being a turn-based RPG; Skylander Ring of Heroes will require you to use the two special abilities of your Skylanders in every encounter. As we mentioned earlier in the article, there are a total of six abilities you will have to use to come victorious against your enemies. In the early stages of the Skylanders Ring of Heroes, assigning a combo key without giving it much thought will get you through a lot of fights and mitigate the effects of constant grinding. What we mean is, just create a simple sequence of ability attacks and you will win almost every encounter. However, in the later stages of the game, you need to make sure to use the right abilities and elements to reach glory. This is where the combo key feature becomes even more relevant. 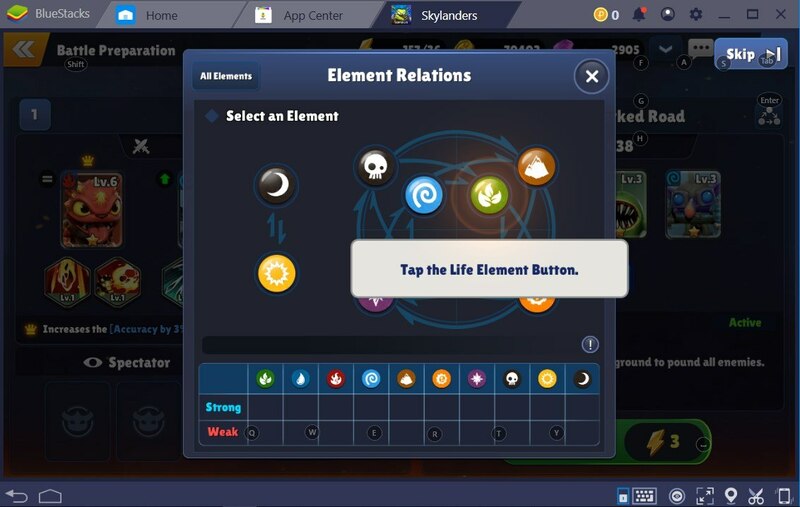 First, take a look at our Skylanders Ring of Heroes tips and tricks article to learn about the element relations. Then, prepare your team accordingly for the battle. Now all you need to do is create a sequence of devastating attacks using the combo key feature that will exploit the enemy Skylanders’. Life element is weak against air element. In the next battle, the enemy Skylanders team will be composed of two life element Skylanders. Due to that, our team needs to have at least one air element Skylander. After composing our team, we head to the battle. Now we need to put the abilities of our air element Skylander to use. Best way to do this, of course, using the combo key feature. Create a sequence of air ability attacks using the combo key feature, exploit the weakness of the enemy Skylanders, and increase the odds of victory. What do you think about this article? Do let us know in the comments section below. We love it when we hear from you!